Crash, Bang, Workshops are 5 Sunday morning workshops for children aged 5-6 and 7-8, exploring on the basics of Western and World rhythms. Led by Joshua Bishop and Caitlin Alais Callahan taking place in the beautiful crypt at St George’s, Bristol each session will be one hour long. 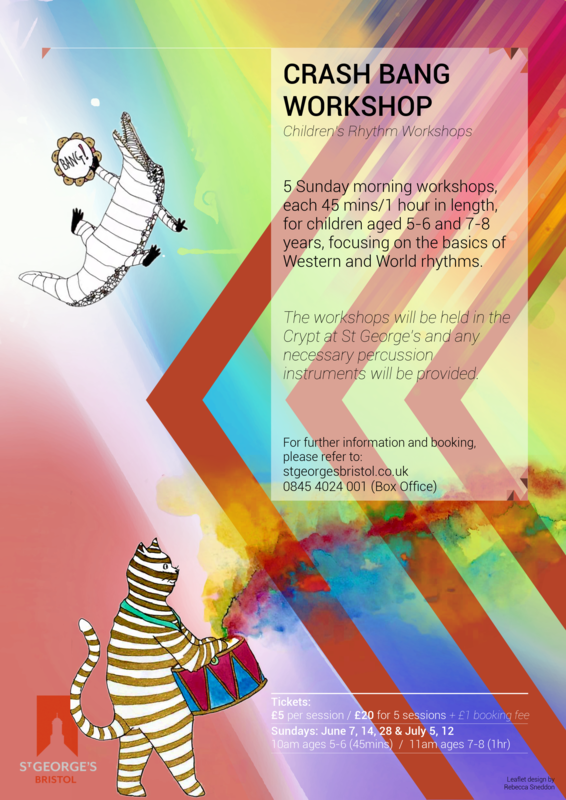 Rhythm connects sound and melody in every form of music, and in these five fun interactive workshops we look at how it’s done. Using percussion and dance from around the world, we will explore rhythms like the excitable Scottish Ceilidh music, the danceable Cuban Salsa, the groovy Calypso from Trinidad and Tobago, the bobbing Austrian Waltz and the smooth rhythms of Brazilian Bossa Nova and Wild Samba. No prior musical experience is required for any of the sessions, and we guarantee that you’ll be drumming, dancing and desperate to come back! As well as learning about rhythm and musical time, each session will focus a little on the notation of the rhythms we play and feel. Understanding rhythmic notation is fundamental for good performance on any instrument, as well as having huge benefits for sight reading and improvisation. Of course, rhythm must be felt, and we will therefore be playing and performing all the rhythms we learn before considering how we might be able to draw or write them down. 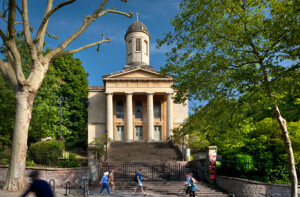 St George’s, Bristol was built as a church in the 19th century and was renovated 30 years ago into a world-class concert hall situated between the hustle and bustle of Park St and the idyllic Brandon Hill. Perfectly placed and boasting one of the finest acoustics you will ever hear, St George’s has a unique atmosphere which makes it an important venue for the world’s leading classical and jazz artists visiting Bristol. Beginning in the second half of the Summer term, the workshops will run for five weeks at 11am – 12 noon. Sessions run from 10am-10:45 (5-6 years) and 11-12noon (7-8 years) and cost £5 per child per week, or book into all five for £20.